From the Collection Trenches: The Reviews (and Paperbacks) Are In! So it’s been a week since the release of And Her Smile Will Untether the Universe. And what an insanely exciting week it’s been! I mean, I have a book that’s been turned loose upon the world! I’m also thrilled that I’ve been hearing back from those reviewers who received advance reading copies, and I couldn’t be more honored and thrilled at the responses so far! Obviously, as a writer, you always hope that your work will resonate with readers, but the initial response to And Her Smile has definitely been above and beyond what I’d hoped for/dreamed of/demanded from the Elder Gods, so I want to thank everyone who’s read the collection so far, and I hope that the stories continue to resonate with readers as they delve into the collection. There are several more reviews over at Goodreads and Amazon, so head on over there for even more collection-y goodness. In particular, visit the Goodreads page for the awesome giveaway that JournalStone has set up; ten lucky readers will receive copies of the paperback edition! Hooray! Speaking of paperbacks, they have started arriving (as evidenced above! ), so if you pre-ordered the collection, it should be arriving forthwith! Also, if you did support this very enthusiastic author right here and purchased the collection, I would seriously love it if you shared a picture of the collection on Facebook and Twitter, so that I could see my stories, nestled happily in their new home. It will do this little writer’s heart good to see the book out and about in the world! Next week, I’ll be checking back in with more collection updates as well as a feature on a few of the very cool books I’ve been reading this year, in particular from some of my favorite female authors of horror, dark fantasy, and the weird. The official Women in Horror Month might be over, but around here, we support those ladies of the macabre year-round! 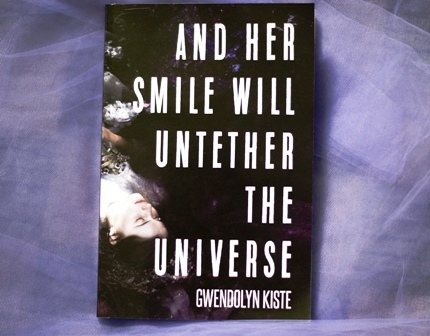 This entry was posted in Book Promotion, Fiction and tagged And Her Smile Will Untether the Universe on April 21, 2017 by gwendolynkiste. RELEASE DAY: My Debut Collection Is Now Available! And it’s official: I have a book. An honest-to-goodness, this-is-for-real, my-name-on-the-cover, out-in-the-wild book. 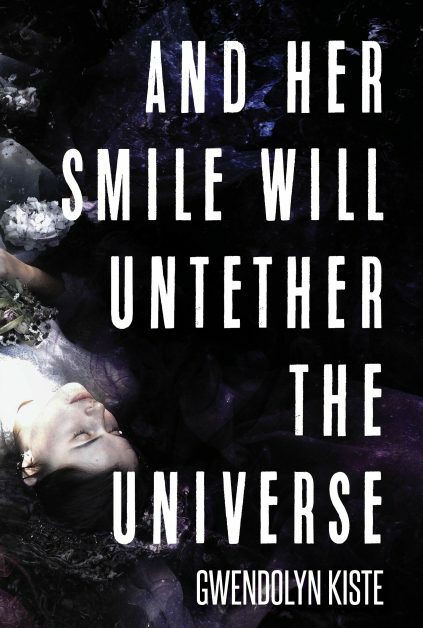 And Her Smile Will Untether the Universe is now available, both at the JournalStone website as well as through Amazon. Seriously. This is real. And surreal. Today is truly one of the most thrilling and overwhelming experiences of my life. Even as I’m writing this blog, I wonder: how do you encapsulate all the highs and lows that lead up to an author’s first book? Well, for one, I want to give a major shout-out right here and now. I’ve said this before and I’ll say it again (and again and again): tremendous thanks to Jess Landry, my amazing editor at JournalStone. If not for her, this book would not be making its debut in the world. While there were certainly plenty of challenges over the course of writing these fourteen stories, the experience working with Jess was nothing short of a dream. She is the most wonderful, professional, and extraordinarily talented editor (and writer! ), and it was beyond an honor to work with her on this project. I’m still in awe and shock that I had such a fantastic editor and fantastic experience for my first book. Writing’s a tough, tough business, but every once in a great while, the stars align in your favor. Jess made those stars align, track changes and all. While today marks the official debut of the collection, this is hardly the end of the journey. Over the coming weeks, I’ll be back at this blog to highlight the stories from the collection, in particular the five brand-new tales. I’ll also be making a few virtual appearances elsewhere. I recently recorded a very fun and very lively interview with the terrific guys at Miskatonic Musings; we discussed the collection in-depth and also talked about everything from Oscar winners and outsiders to the terrors of childbirth. Good, gory stuff all around! Also, please check out my interview on Hellnotes where I give a peek behind the curtain at the making of the collection as well as a second feature that spotlighted “All the Red Apples Have Withered to Gray,” one of the fourteen tales that appears in And Her Smile‘s table of contents. So as if it weren’t already obvious, you’ll be hearing lots from me in the next month, both here as well as out and about in the great ether of the internet. After all, a writer only gets their first book once, and I plan on relishing every minute of this process! In the meantime, if you’re one of the very awesome people who purchased the collection, please let me know what you think! Obviously, reviews are always terrific, but if you’d rather just drop me a note via my website or in a message on social media, that would be incredible too. I’d absolutely love to hear your thoughts on the stories! After all, books are merely dead trees if they don’t have readers to enjoy them! And if you don’t have a copy yet, head on over to the official Goodreads page, and enter to win one of ten paperback editions of the collection! Hooray for free books! Finally, to everyone reading this post, I want to thank you so much for your support of my writing. I appreciate it more than you will ever know! This entry was posted in Book Promotion, Fiction on April 14, 2017 by gwendolynkiste. Welcome back to this month’s Submission Roundup! Lots of fabulous opportunities for all you writers out there, so if you’ve got a story looking for a home, one of these venues might be the perfect place for you to send it! Before we get started, let me note that I am not a representative for any of these publications; I’m merely spreading the word! If you have any questions, be sure to direct them to the editors at the venue in question. 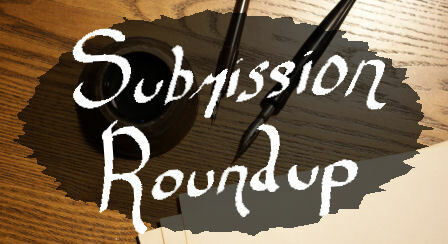 And now let’s dive in to this month’s Submission Roundup! What They Want: The current theme is Medieval Mayhem. Think King Arthur, Robin Hood, Black Death, the Crusades, the Renaissance, and the like. For this issue, no fantasy or other speculative fiction; the submitted stories should focus on real-world based medieval tales. What They Want: Open to fantasy, science fiction, and horror stories. What They Want: The theme is “Cat’s Breakfast,” and the anthology is open to speculative satire stories in the vein of Kurt Vonnegut. What They Want: The current theme is Afromyth, and the anthology will focus on mythical fantasy, including but not limited to gods, mysticism, mythical creatures, and fairy tales. Please note that at least one main character must be of indigenous African descent, and the editors are looking in general for diverse characters and diverse settings. What They Want: Open to post-apocalyptic military horror stories. What They Want: Timeless Tales focuses on retellings of fairy tales and other myths. The current theme is Arthurian legends. What They Want: A phobia-themed anthology. Because phobias will be closed out if too many submissions are received for that particular topic, the sooner you submit your fiction, the better. This entry was posted in Fiction, Submission Roundup on April 3, 2017 by gwendolynkiste.